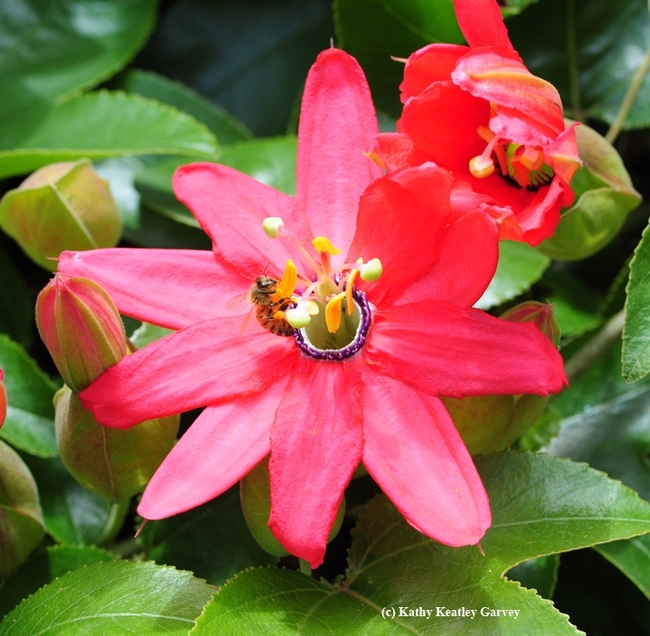 Red Passionflower Vine: Pretty But Poisonous? If want to plant a passionflower vine (Passiflora)--the host plant of Gulf Fritillary butterflies (Agraulis vanillae)--in your garden, go for the species that produce lavender or purple flowers, "not the red ones." That's what we've been told for years. We hear that butterflies don't like the red ones, and that they may, in fact, be poisonous to them. 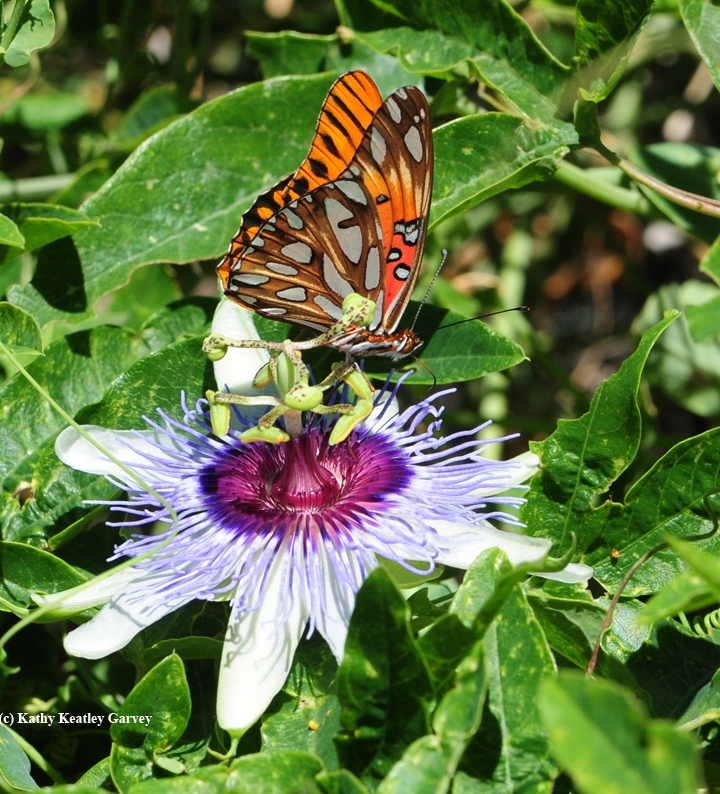 Which brings us to the question from a reader: "I have the Maypop and Purple Passionvine, which is working well as a host plant for the Gulf Frit. 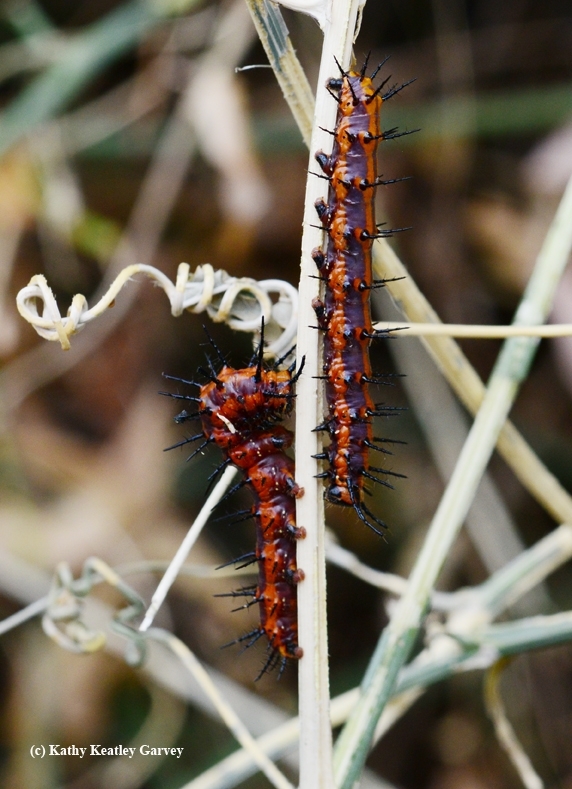 I recently bought a Red Passionvine and then read it is poisonous to the Gulf Frit. Is it true?" We asked butterfly guru Art Shapiro, UC Davis distinguished professor of evolution and ecology, who has monitored butterfly populations in Central California for more than four decades and publishes his research and observations on his website. "They don't use some of the red-flowered species," Shapiro says. "I don't know if they're actually poisonous. I've never found the bug on P. jamesonii around Ohlone Park in Berkeley, where there's tons of it. There's a large plant at the northwest corner of 3rd and B in Davis that may be this species, and they don't use it, either." P. jamesoni, also known as "Coral Seas," (one of some 500 varieties in the world, see Wikipedia for the full list) is indeed striking with its brilliant red flowers. As an aside, P. jamesoni is listed on the IUCN Red List of Threatened Species. That would be the International Union for the Conservation of Nature, which describes itself "an international organization working in the field of nature conservation and sustainable use of natural resource an international organization." "Passiflora jamesonii is endemic to the Ecuadorean Andes, where it is known from five subpopulations on both sides of the range. Only one subpopulation is inside Ecuador's protected areas network. The species seems to prefer untouched areas, so fires are a severe threat," according to the IUCN Red List. I have a Passiflora edulis “Frederick” that’s producing fruit for the time. I have not noticed any butterflies and there are no holes on the leaves, but obviously the flowers are getting pollinated. Butterfly Summit: Are Butterflies Heralds of Apocalypse?